When we started our interview with Potomac Nationals manager Tripp Keister, we first talked about the transitions he has seen from top prospect Victor Robles who Keister managed last year to inheriting the Nationals #2 and #3 prospects this year in Juan Soto and Carter Kieboom. Keister made it clear that he does not play favorites among the 25-players on his High-A roster. “I don’t differentiate between — there’s twenty-five guys on our roster and they’re all like my sons,” Keister said. “We’re trying to get them all better. Obviously we spend a lot of attention talking more about [the top prospects] than the others, but they’re all like my sons. Keister has been managing the Potomac Nationals for five years and started with the Nationals organization as a coach in the Gulf Coast League in 2012. He also was a manager in college baseball and prior to that he was a minor leaguer in the Mets organization as a successful then at the end a struggling outfielder. Keister was a star at the University of Delaware, and he still has his family home in Delaware where he has 2 daughters and a son who is a star high school sophomore shortstop. Keister’s own personal experiences as an amateur star and a player who was very successful in High-A ball but then dropped off the radar in Double-A is the type of experience that can only help his players because he has been there with the highs and lows. He has players like Juan Soto who is only 3 years older than his own son, and you can see Keister’s nurturing style. Almost all of the current young Nationals stars have come through Keister’s teams. He wants them to learn at his level and if they make a stupid mistake as he said it becomes a learning point and much better to happen in High-A than the big leagues. He had one of those learning instances the night before when the defense was shifting there was nobody covering 3rd base and the runner on 2nd just took 3rd base. It happens. Mistakes happen as Keister said and learning from it is the true lesson. This level is about on-the-job training. At his level, these players are students. Approach is a key and Keister talked about the importance of the two-strike approach in particular. Keister went through the recent successes of players who have been quick to the majors after leaving Potomac like Victor Robles last year and Koda Glover the year before that and Wilmer Difo the year before that. We talked about the general acceptance of strikeouts in today’s game. Keister who is 47 years old is old-school when it comes to strikeouts. He loves them for his pitchers but hates them for his batters. “One of the things in the industry that is puzzling is the acceptance of strikeouts which [for me] is hard to take,” Keister said. “It used to be [when I was growing up] strikeouts weren’t acceptable. It’s definitely come from the top-down that we have to do better with 2-strikes. We have to do a better job of taking balls and getting yourself into a better hitter’s count. It’s not easy. It just doesn’t happen overnight. It’s a process. We talk about that the best two strike approach is not getting yourself to two strikes! That conversation has to be music to many people’s ears. We talk all the time about two-strike approach but also how some players expand the zone like Michael Taylor and instead of a 2-1 count, they put themselves in the deadly 1-2 count. Before Taylor, there was Danny Espinosa who seemed to get himself into these holes all of the time and general manager Mike Rizzo finally got rid of him. The key is getting to hitter’s counts and avoiding the pitcher’s counts. You can see the new approach working with a player like Brian Goodwin. Taylor seems to be the last of the free swingers who graduated to the majors. Much of the top-down approach can now be seen with the hiring of Kevin Long who has brought his hitting philosophy to the organization. Tripp Keister was a pleasure to spend time with and learn his philosophies. It is working. You can see it. His players are learning “The Nationals Way”. Juan Soto stopped by as they had bunting drills which I got invited to watch. They are doing it all. These players need to learn it all. 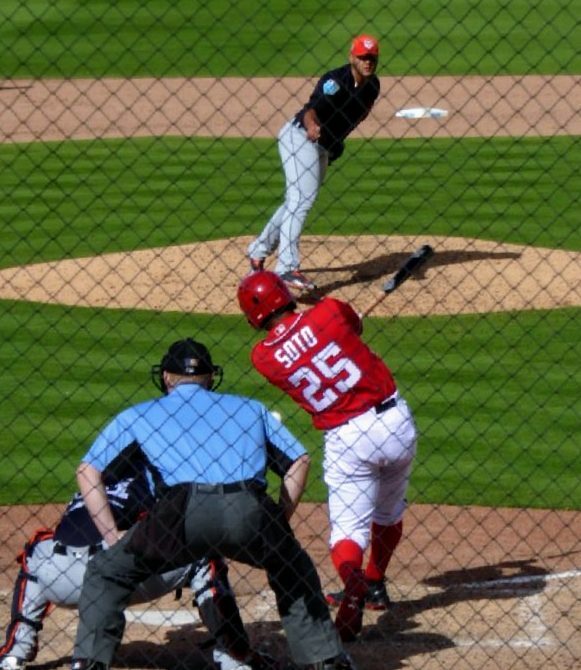 When Juan Soto gets up to the Majors and the opposing team puts a shift on him leaving 3rd base open, he will be able to beat the shift with a bunt if he wants to. This entry was posted in CoachingStaff, Prospects. Bookmark the permalink.